The Heritage and Harmony Fiesta will be staged at the Redland Museum, Cleveland, on Sunday 24th of March. 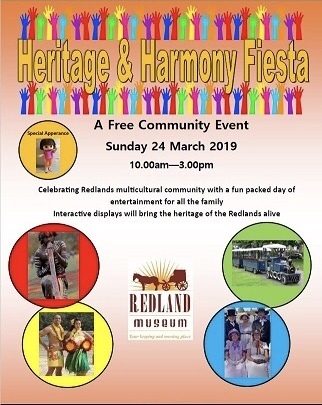 This FREE community event will celebrate the rich heritage of the Redlands, whilst at the same time acknowledging the area's diverse history and multicultural communities that have helped shaped our landscape. The event will feature music, dance and foods from around the world as well as a costume display, story corner and craft. 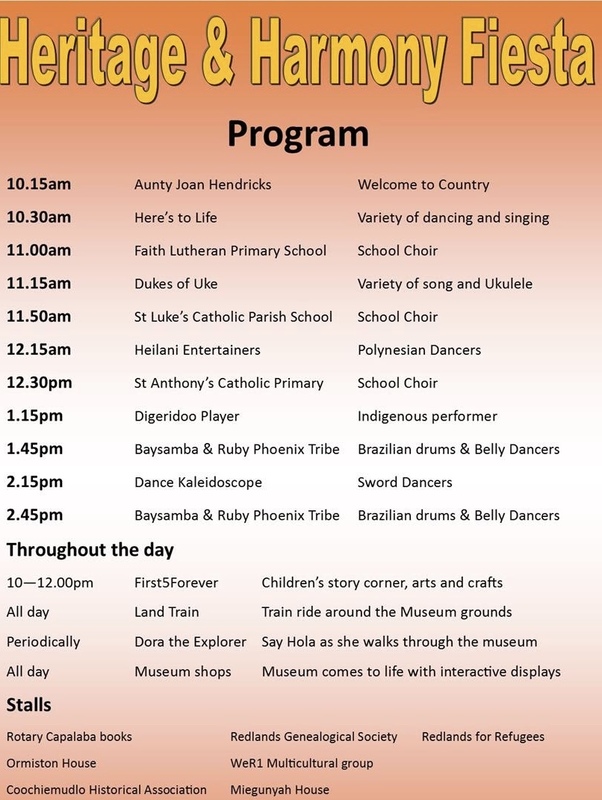 Here's the day's program and doesn't it look like a cracker! 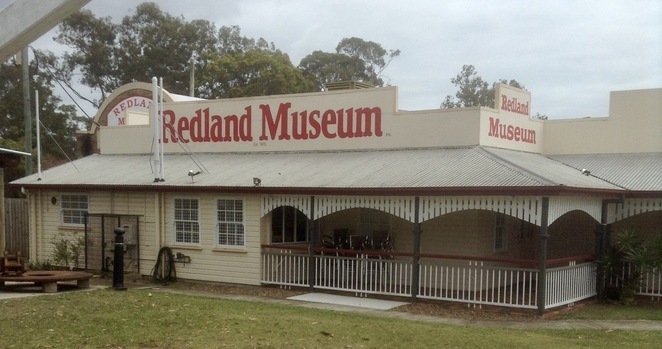 The Redland Library will host stories from the First Five Forever program for real little people whilst older siblings can follow in the Museum's " Find your Forebears" trail to locate stories about people from different communities. WeR1 multicultural group will be offering some delicious food and beverages to purchase, so why not bring the family and enjoy this wonderful day out. The fiesta commences at 10am and closes at 3pm. Entry to the Museum will also be FREE so plan to lose an hour looking over the exhibitions as well. The Redland Museum is located at 60 Smith Street, Cleveland, just down from Cleveland State High School. It has ramps for easy access and both off-street and on-street parking. This most certainly looks like one of those days with something for all the family. See you there! Why? Great entertainment for all the family.